Each 1000 piece jigsaw puzzle is designed by Joseph Burgess and measures 51cm x 69cm. Available in two sizes. This 1000-piece jigsaw puzzle is designed by Joseph Burgess and measures 50 cm x 68 cm. 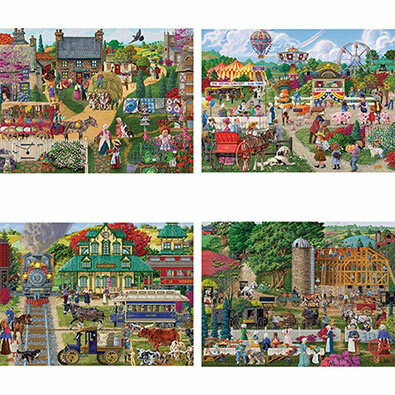 This puzzle depicts a busy town square in the middle of the country. People are working hard to build new buildings and take care of their neighbours. Available in two-piece counts. This 1000-piece jigsaw puzzle is designed by Joseph Burgess and measures 50 cm x 68 cm. Carriages stop right before the tracks as a train rolls into a busy station. Available in two-piece counts. This 1000-piece jigsaw puzzle is designed by Joseph Burgess and measures 50 cm x 68 cm. This puzzle depicts a busy town centre. Vendors are beginning to set up shop to sell a variety of wares. Available in two-piece counts. This 1000-piece jigsaw puzzle is designed by Joseph Burgess and measures 50 cm x 68 cm. This puzzle depicts a colourful fair full of stands, rides and attractions. Available in two-piece counts.